Banana is one of the pillars of Filipino food. In France, it is the third fruit in consumption behind apples and oranges. Here, a banana is much more than a simple fruit. First of all, Filipinos do not only consider banana as a dessert. And here, it is not an imported product. Bananas, they grow all over the archipelago. The country is indeed the second largest producer after India and the second largest exporter, but this time behind Ecuador (apparently India keeps its annual 23 million tons of bananas to itself, which is weird, we’ll go back to that). 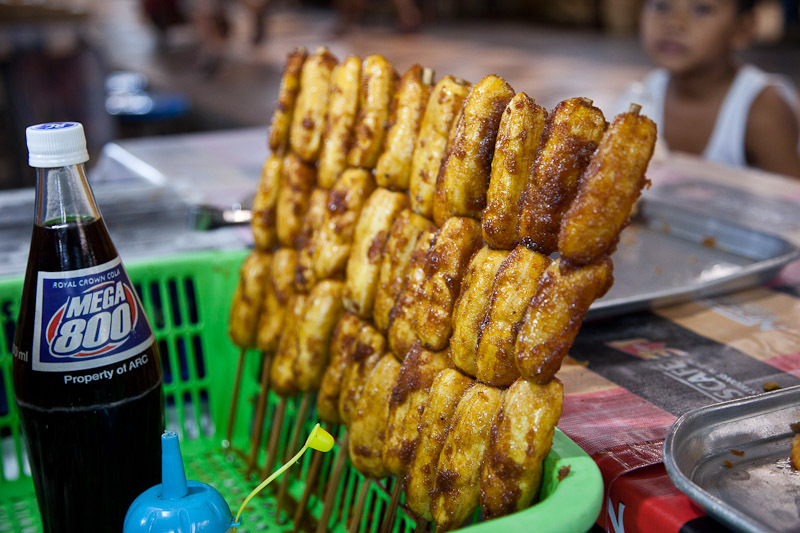 In the Philippines, banana is eaten in all its forms: raw, cooked, fried on a skewer, in blossom, in ketchup, and so on. I will explain it all. But first, let’s take a closer look at the fruit. 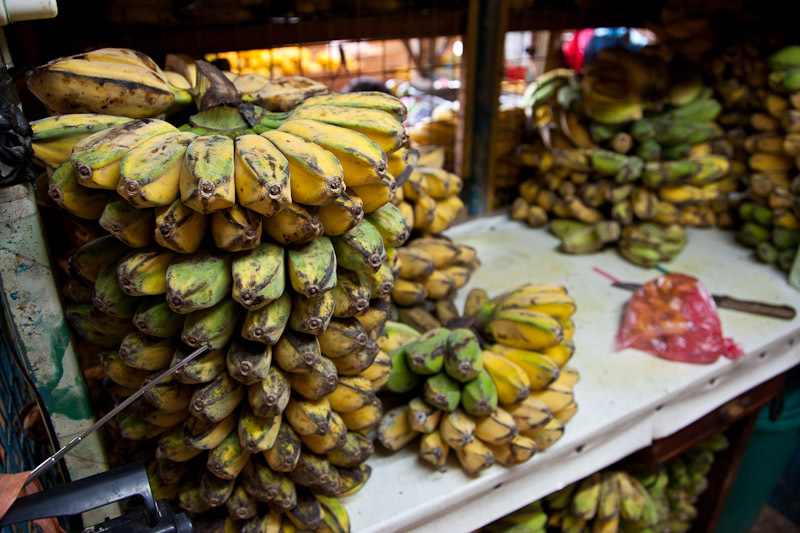 What the banana scholars tell us is that this fruit originates from South-East Asia. It was first domesticated in Papua-New-Guinea around 8000 years ago. This culture spread around the region, following the exact same path as our Austronesians eating raw fish. So it developped in the Philippines. Then the Austronesians, who brought bananas as they traveled, planted bananas on their way. That’s how the Pacific islands soon started to all have their own banana plants 4000 years ago, all issued from the Filipino cultivar. In Madagascar, bananas arrived a bit later, around 1000 BCE, and those ones seem to come from an Indonesian cultivar. From Madagascar, bananas spread around the African continent quite quickly. A few centuries later, the Portuguese came and brought the fruits to the Canaries, and then the Carabbeans in the 16th century. There, it spread quite quickly once again. Well, in a few words, bananas grow anywhere it’s warm, and everybody loves them, even if it’s cold. The whole European Union is a fan, the United States too, and even the Chinese love them! All the continents are crazy about bananas. It’s one of the few things we all have in common. To me, banana is the most fascinating fruit. First of all, a banana tree is not a tree. It’s an herb. An herb that makes fruits, that’s already pretty cool. But that’s not all. The cultivars we eat are sterile, which is why they don’t have seeds inside. Well, there are still traces of seeds, you know those minuscule brownish stuff at the center of the fruit? There it is, long ago those brownish stuff were much bigger. Wild bananas, in the jungle, still have crazy big seeds inside. Speaking about the jungle, bananas exist there in shapes and colors that you wouldn’t believe. Oh well, we don’t know them all, they never get to us, the funky bananas, but believe me, the Papus for instance, they have the best ones. White and green stripped bananas, with an orange pulp. Some are as big as the pinky. Some are gigantic. Some red, or violet. Tasting like an apple, tasting like strawberry. I’ve also read about bubble-gum pink bananas. Yeah, pink, the skin as the pulp. It’s so crazy it deserves other articles. I’ll write about that, it will be fun. We, Frenchies, don’t really know anything about bananas. We always eat the same cultivar. And even though we have been eating it for centuries now, we are still very shy with this awesome fruit. We don’t do a lot with it, though it can do so much. We just peel it, eat it, like that, because it’s easy, practical, you won’t get dirty, you won’t be hungry. Sometimes we kind of try to bake with it, but not as much as the Anglo-Saxons, a bit less inhibited than we are. They make banana bread, muffins, that sort of thing. But still the banana is very underutilized. Let’s look at what people who have a real banana culture make, it will open new horizons. 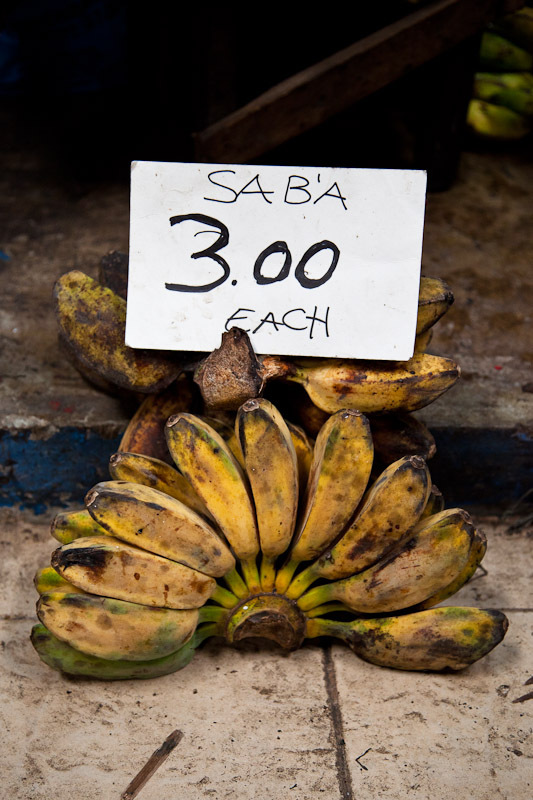 Out of 91 cultivars used in the Philippines, the most common is the saba banana. It’s a pure native product. It doesn’t look like the long, bright yellow fruit we get from the Carabbeans, called Cavendish. It is a plantain, like those huge bananas with a sort of grey skin that we can find in African grocery stores in Paris. 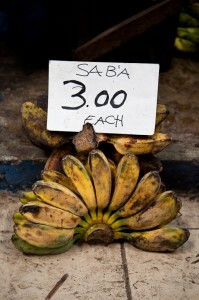 But the saba isn’t the giant kind, no, it’s a tiny cute fruit that you can keep in your pocket. Its shape is surprising, because its skin has angles. A bit like a gemstone. Its pulp isn’t hard like the big African plantains that you have to boil and fry. It is also much sweeter. And last but not least, it is very cheap: around 3 pesos per banana, so about 5 cents of euro. So the saba is a sweet small plantain from the Philippines, and there is a lot you can cook with it. What’s interesting about saba is that it’s perfectly ambivalent. It can work with sweet and savory. Its pulp is not too sweet, tender but still firm, and it has the same nutritional value as a potato. So it can be used as a fruit, a vegetable or a feculent, a bit like sweet potatoes or kamote as they’re called here. It’s your call. As a fruit, it’s great in deserts. As a vegetable, it stays in shape when you cook it, and balances naturally spicy dishes. And well, whatever you do with it, is a carb. One of the most common ways to prepare saba in the Philippines is banana cue. Or banana Q. It’s a basic street food. The little sabas are peeled and deep fried in a wok. As they fry, some brown sugar is added. It will turn into caramel and cover the bananas. When they’re done, they are crunchy outside, melting inside. They are sold on a stick, 2 or 3 bananas at a time, and voilà. One of those skewers kills your appetite and costs only 10 to 12 pesos, so around 20 cents of euro. When I was talking about sweet potato, it was not only because it’s a sweet carb. Sweet potato can be prepared the same way as the saba, so you’ll get kamote cue. 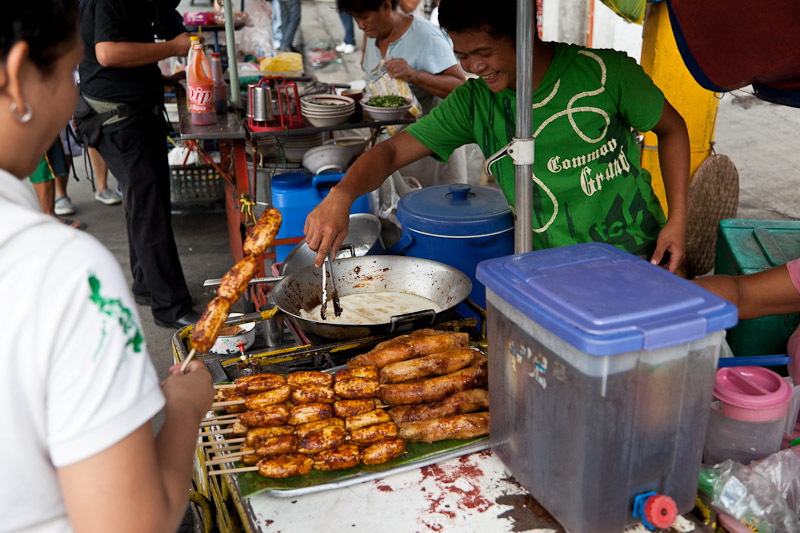 There are a lot of other types of sweet street food made with saba. For instance, they can be eaten rolled in sorts of crepes and fried. They call it turron, but it has absolutely no connexion to the spanish delicacy. They also like sabas cut in a fan shape, and then again fried with brown sugar. In short, fried bananas and brown sugar is a winning combination, that will be used in every way possible. For example, fritters, called the maruya. And on the island of Mindanao, they do almost the same, but the saba is chargrilled. It is called ginanggang. All those sweet things are perfect for the merienda. Filipino cuisine also offers a range of pastries and other little cakes made with banana pulp. 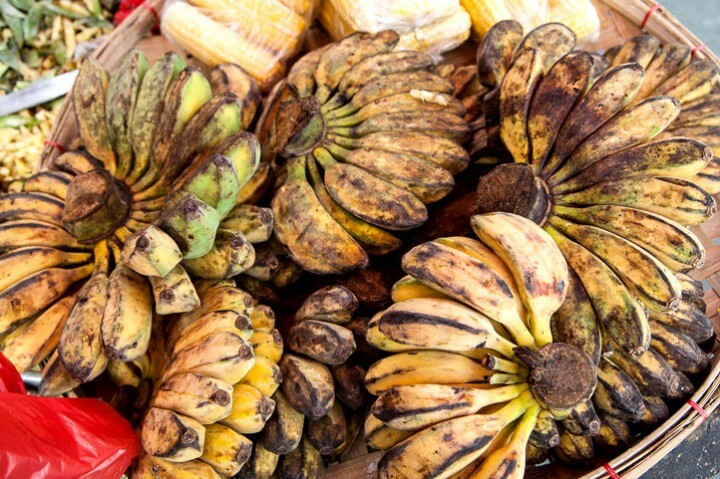 Some are from the United States, like banana bread, pancakes or muffins, some are more local, like banana puto. The puto is a tiny and cute rice cake, steam-cooked. So for most Western people, it will be good, but probably a little too chewy. Bananas can also be cooked with rice or tapioca and coconut milk. And when the banana is sweetened, you get saging na saba, one of the major ingredients of the halo halo, the technicolor desert. So the saba can be used in many ways if you are looking for sweetness. But it is not only meant to be a desert or a sugary snack. It can be cooked with spicy dishes, because their sweet pulp will neutralize the spices. Take puchero for example: it’s a stew made from beef and bananas in a tomato sauce. And the saba is also nice on its own. It is not impossible to eat raw, unlike other plantains. Some other banana varieties, like the latundan, are much sweeter and tender, so if you just want a fruit they appear as better options. But it depends on what you’re doing. For instance, if you have to travel, these sweeter bananas will have a hard time. The saba can take the trip, because its skin is much thicker. For a long boat or jeepney trip for instance, it’s the one. And before being a fruit, it was a flower. A huge, beautiful flower, making me think of an artichoke, because of its shape and of its texture. Filipinos eat the male inflorescence of the saba, which is relatively small compared to other kinds of bananas. It has a nice warm color, between burgundy and purple on the outside, golden on the inside. It’s not the easiest product to cook, because you have to know how to cut it, and it has a bad tendency to turn brown. And if you don’t follow the rules, it’s awfully bitter. But if you use it properly, banana blossom is the best. The bud and the blossom are cooked as vegetables, usually stewed with vinegar, meat and coconut milk, which is called paksiw, one of the national dishes. But I have to say I prefer a lighter way to cook them : ginataan puso ng saging, which is banana blossom and bud in a savory coconut milk stew. If one day I manage not to ruin this dish (it’s always a failure, because it’s really hard to handle this nice flower), I’ll give you the recipe. The most amazing use of the saba is an exclusive Filipino recipe that is dear to me : banana ketchup. The American, who have left the Philippines (ahem, well, if don’t count all the American military bases still in the country) at the end of World War II, left here a taste for some US products, such as Coca-Cola and ketchup. But here it is : during the war, there was a shortage in ketchup in the Philippines. No way to get it imported, it’s the war. No way to make some either : there might be a few tomatoes here, but not enough to launch an industrial sauce production. So, what do we have here? Well, we have bananas, boss. So go make some ketchup with it ! To be honest it did not exactly go that way. At the origin of banana ketchup, or banana catsup, there’s a woman, a war heroin, Maria Orosa. She was a chemist, a food technologist. She invented a load of products to feed Filipinos, some of them getting pretty handy during the war. For instance Soyalac, a soya bean powder that Filipino and American prisoners have blessed when they were captive. 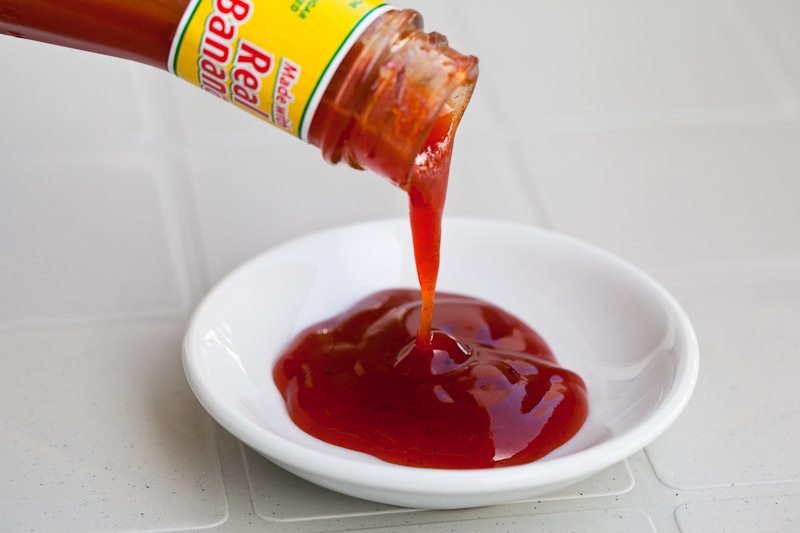 Maria Orosa invented the recipe for banana ketchup following the tomato ketchup recipe, more or less. She used saba, vinegar, sugar and spices. Basically, the product is not very appealing because it doesn’t look like traditional ketchup. It has this brownish color. But Filipinos like to put color in their lives, and also in their food. Hop, a little bit of red food coloring, and ta-dah, you get a product that looks like ketchup, even though a little more translucent and glossy, but most of all, much sweeter. It’s gorgeous. With kamote fries, it’s just perfect. But it is also used as a spaghetti sauce, it’s the most Filipino way to have pasta. The spaghetti will be a lot sweeter than in the Italian version, which makes it a great treat for the merienda. As we have seen, the saba is a fruit, a vegetable, a carb, but it is also ketchup. I’m going to go search for the other hidden bananas. Though I’ve been looking everywhere in the markets of Manila, I can’t find any of the funky bananas that are put aside by the standardization of food. 4, 5 different varieties are sold, and that’s it. Where are the remaining 86 hiding? I’ll find them. The quest for the orange banana has just begun. 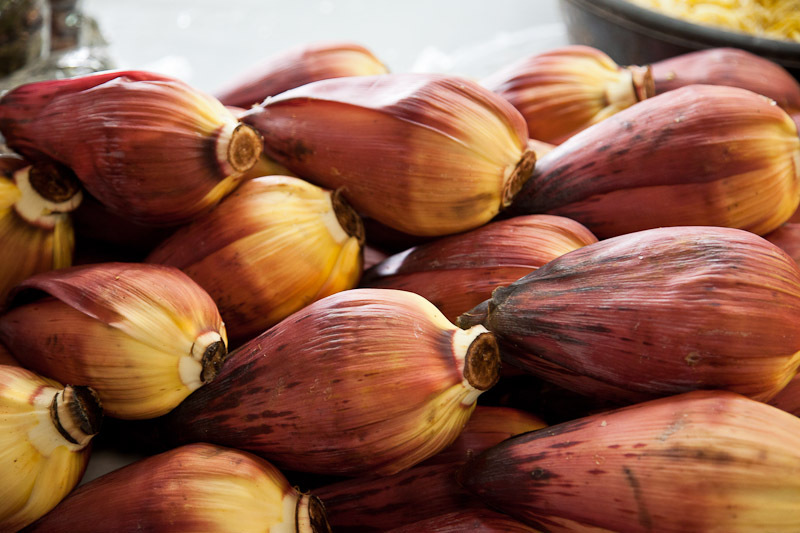 Thanks for putting it out for the world to know about this philippine saba/cardaba banana. 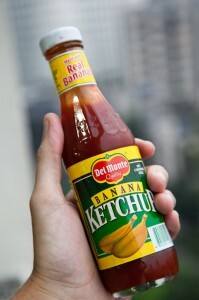 Btw, I am an addict of banana catsup, haha! True, you cannot find much of the funky (as you say) varieties of banana in Metro Manila area, even perhaps in the whole island of Luzon. I have no idea why. I am from Zamboanga City in the Mindanao Island and in our city alone, I may have probably tasted and encountered at least 10 varieties of banana. I can recall eating two varieties of colored bananas one of which is red/red violet. Based on my recollection (some of my family is into agricultural farming), this Manila saba variety is actually not the “real” saba,lol! The real saba is this really small, usually not longer than 3.5″ versions of the Manila saba, and its pulp is slight golden yellow (pale egg yolk-ish) in hue. The “real” saba is highly prized because it isn’t farmed much because its yield is rather small. Hence, a tad pricier. It is also best just boiled semi-ripe. The Manila saba variety may likely be a Cardaba to us in Mindanao, and there are lots of cardaba varieties there. Some are as long as 6-8″ ranging from dark green to light yellow/whitish unripe. If you really want to see those funky bananas,I advise you better go to Mindanao. Go to Davao which is a the heart of Banana plantation in the Philippines. Try asking around their locals and with luck, I’m sure you can probably see and taste some funky bananas. Good luck on your banana quest, and thank you once again for this great write-up.